Set amidst magnificent mountains and tall pine trees, Stadio Biathlon is a spectacular stadium and the venue for the Biathlon World Cup 2020. Covered entirely in snow, the stadium makes for a splendid sight to behold. During competition, the place is abuzz with excitement. It is quite thrilling to watch the players cross-country ski and shoot targets at regular intervals. The stadium treats you to panoramic views that compel you to reach for your cameras. A magnificent stadium to witness, visit this place when you are in Italy. 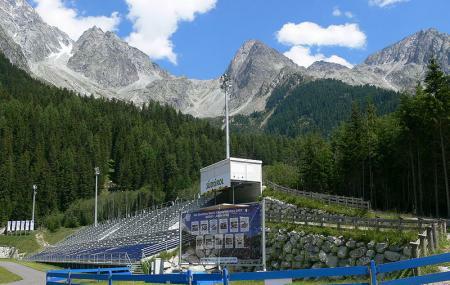 Try the best Rasen-antholz trip planner to visit this Stadio Biathlon as well as many others. Add accommodation and hotels in Rasen-antholz that suit your budget including the most recommended ones like Hotel Koflerhof Wellness & Spa, Hotel Gasthof EdelweiÃÃÃ‚ƒŸ, Hotel Garni GrÃÃÃ‚ƒÂ¼nmoos and Turm Hotel Gschwendt. If you want to add the visit to Stadio Biathlon in your trip, you can choose from the variety of Rasen-antholz vacation packages that can be designed to suit your preferences. These packages also cover your major concern of how to reach Rasen-antholz. Love this? Explore the entire list of places to visit in Rasen-antholz before you plan your trip. Fancy a good night's sleep after a tiring day? Check out where to stay in Rasen-antholz and book an accommodation of your choice. Nice overview around. Even when the competitions are boring one can relax and enjoy Alps around.